Out west of Colorado Springs for the weekend on a girl scout camping trip. Their troop just formed this past school year so they are just starting to get a full slate of activities up. The troop chose to head down to Mueller State Park for this inaugural event. It sits in the shadow of the west face of Pikes Peak. I could see Pikes most of the time peaking out over the trees. Kind of felt like it was calling me to come over for a run. But it wasn’t in the cards. One of the main reasons they came down to this park was that is is only minutes from Florissant Fossil Beds National Monument. I had never been there. Colorado has so many federal level attractions like this that it takes some time to get to all of them. This place was interesting for what it was, not as much for what it is now. So back before we roamed the earth, Colorado was a much different place in this area. There was a nearby active volcano here in Colorado. Much of the area we were in was a hot swampy area teeming with life. There were big trees here that were taller than the Statue of Liberty. Then one day the volcano erupted. All this ash combined with the dirt and water to created a huge mudslide that went for miles. It covered the landscape in this area. Those big trees — well, they were surrounded at the base by the mud. 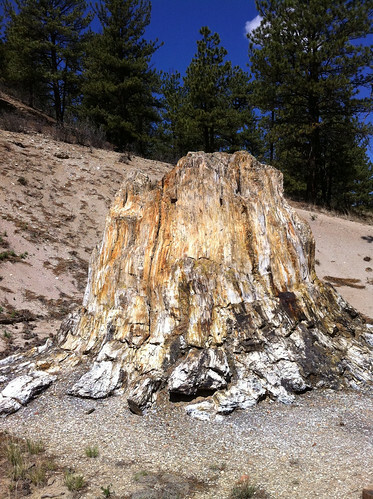 The tops of the trees died off but the base of the trees fossilized down in the mud and was later covered by more dirt. In the 1800s, someone figured out that there was stuff underground and began digging. They weren’t too patient so they used dynamite to try and blow the dirt around those stumps out. This shattered portions of the stumps. Metal bands have been placed around them to hold them in place. 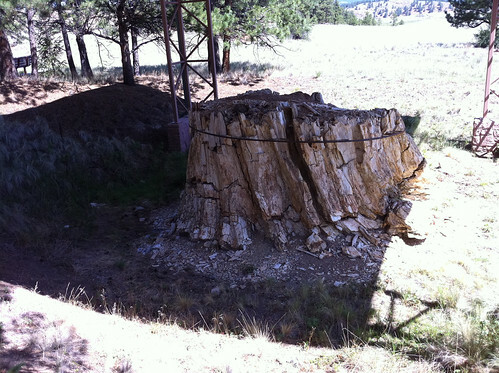 The largest stump on the property is still in tact and we hiked over to it. Apparently, they wanted to take this one to a world’s fair back in the 1800s but it was too big for a rail car. So they started trying to saw it into pieces to be reassembled later on site at the fair. There is a saw blade stuck up in the top of it after it broke off during the attempt. This park has produced some of the best non-dinosaur (none here) fossils in the world. They are on display at famous museums and institutions around the world. They do have a small collection on site but none of the major ones of value. The park is really a place to see what once was and where these things came from. The real unfortunate part is that when people started coming to see this area in the 1800s it was billed as an excavation adventure. They would ride trains up here in their fancy clothes and then proceed to take bags and bags of fossils back home with them. The owners at the time figured there was no way all the fossils could ever be taken. There were so many. But time went on and the place was stripped clean. Now that its federal property, thanks to Nixon, you can’t touch or take anything without committing a felony. A good thing preserved for generations to see. But its too bad that those that came before us did a lot of damage that can’t ever be repaired. The relics are gone. Forever.